TÁNAISTE EAMON GILMORE has insisted this morning that the government is not implementing a cut to the budget available for school children with special educational needs. His comments came after it was announced by the National Council for Special Education (NCSE) yesterday that the number of children in receipt of supports will increase in the next school year by about 10 per cent. This means an effective cut of, in some cases, 25 per cent for some schools. A school with a child with multiple disabilities in September 2013 will be allocated 3 hours and 45 minutes additional teaching support per week – 30 minutes less than last year. An extra 4,000 students needing special education supports means that hours have been adjusted in line with resources but Eamon Gilmore insisted this morning this did not amount to a cut given that the budget of €1.3 billion is the same as in 2011. “The money has not been cut, the numbers of special teachers have not been cut, the number of special needs assistants have not been cut,” he told the Dáil during Leaders’ Questions. He said that for every five teachers operating in the education system, there are two who are specifically dedicated to providing support to children with special educational needs. “Even in these very difficult financial circumstances this government committed to ringfencing the finance available for special educational needs and we have done that,” he insisted. But Gilmore insisted: “Let’s get the facts right first of all, there is no cut,” adding that the NCSE would examine how resources are allocated so they are “used to best effect”. Email “Tánaiste insists: We're not cutting the budget for special needs teaching ”. 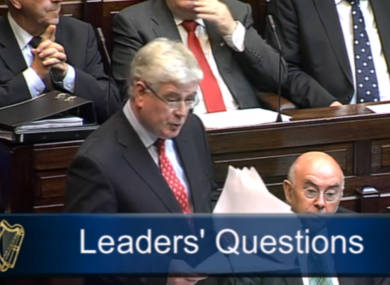 Feedback on “Tánaiste insists: We're not cutting the budget for special needs teaching ”.